Product prices and availability are accurate as of 2019-04-23 23:54:16 EDT and are subject to change. Any price and availability information displayed on http://www.amazon.com/ at the time of purchase will apply to the purchase of this product. 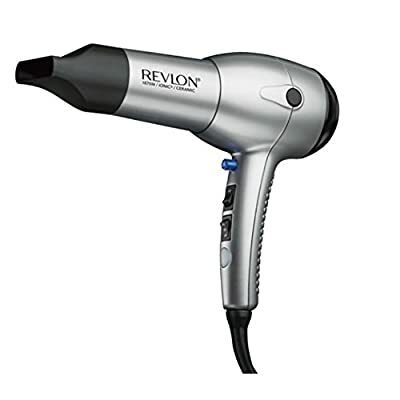 Get the hair you’ve always dreamed of having with the Revlon RV544N6 Tourmaline 1875W Ionic Dryer . Featuring advanced Tourmaline Ionic Technology, this hair dryer gives your hair shine and volume as well as healthier looking styles. Two heat and two speed settings make it easy to achieve that perfect, salon-styled look while the included diffuser attachment lets you create the curls you love. Features advanced tourmaline iconic technology. Ensures ultimate shine and volume. Includes diffuser attachment. Features 2 heat and 2 speed settings. 1-year limited warranty.